"I know, and I love you"
I woke up this morning feeling particularly holy. (Yes, I did just say that BUT stay with me!) I was on a high from last night’s council meeting where we marveled at what God is doing in our church. Before I got out of bed, I grabbed my Bible and read from Romans. “I am not ashamed of the gospel because it is the power of God for the salvation of everyone who believes.” (Romans 1:16) Now I was feeling even more holy because this isn’t how my mornings usually begin when 3 little people are tugging at me. I walked to the kitchen and cracked open a can of coke (Yes, I did just say that too. Coke is my coffee) I was still feeling very holy. Then BAM, my 3 year-old chucked his cup across the kitchen and into the sink as though he were throwing a 10 yard pass to his big brother, and the liquid went flying all over the kitchen. My response was not holy, and I no longer felt holy. Not even a little bit. I was reminded, in that moment, that my righteousness comes from Christ alone. (Philippians 3:9) And that is a very good thing. See I recently went through a really challenging time in my life where who I was and who I wanted to be were very much at war with one another. I took incredible comfort in the words of Paul during that time. (Romans 7:14-26) I’m pretty sure I’d never appreciated this passage more than I did at this specific time in my life. He knows us, and He loves us. Scripture tells us that He knows everything about us- He knows our thoughts before the words are even on our tongue, and He loves us just the same. (Psalm 139:4) We are fully known, and fully loved. Do we believe that? I used to save most of my confession for quick little blurbs like “Sorry for what I did wrong today” because I was so focused on pleasing God, gaining His favor, making Him proud. I did not like to spend my time in prayer being specific with the things I’d done that needed forgiveness. I preferred to spend most of my time thanking Him and telling Him how I was going to do much better tomorrow at obeying His word. Tomorrow I will do much better at being patient with the kids. Tomorrow I will be much more kind to my husband. Tomorrow I will _________ (you fill in the blank). 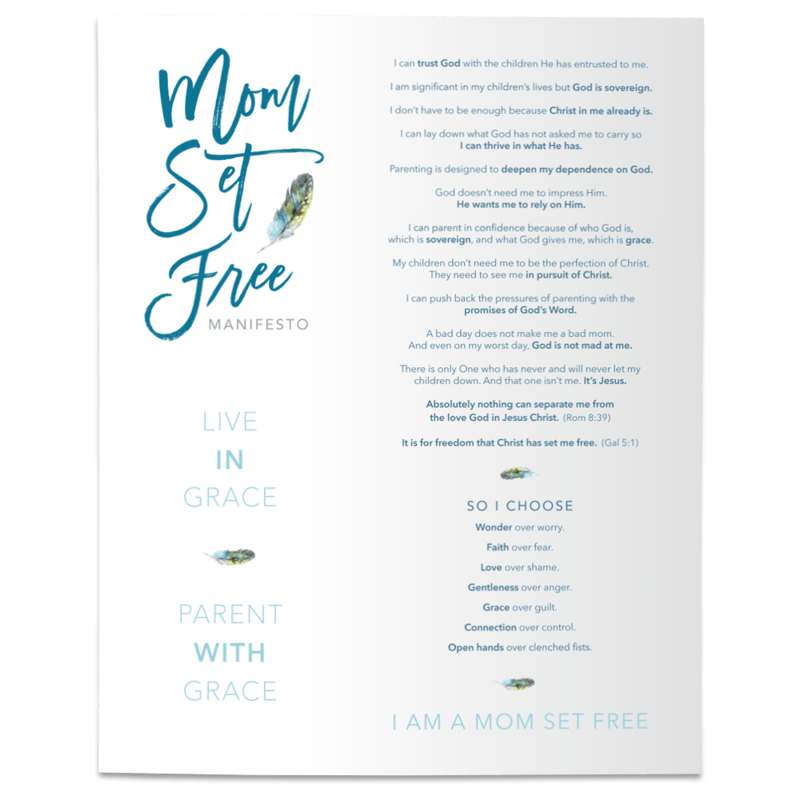 Instead of free falling into His wide-open arms of grace and unloading the burden of my sin that I was carrying on my feeble shoulders, I just focused on what I would do better tomorrow. But you know what, I never did much better “tomorrow.” I might have had glimpses of “better” but it was fleeting because it was exhausting. Try harder Jeannie. Be better Jeannie. Do more Jeannie. Oy vey!!! And what does this have to do with parenting? Well, that is how I was parenting our kids. I’d say things like, “Cal, tomorrow you can try to be nicer to your brother. Today wasn’t your best day but tomorrow you can do better.” Seems harmless, right? Pick yourself up and do better tomorrow! What’s wrong with that? Well, tomorrow, Cal (like me) will still be a sinner desperately in need of a savior. Tomorrow Cal will probably fail again, at something, somehow, and will not be everything he desires to be. Cal will fail. Christ will not. Of course we are teaching our kids about the commandments of Christ and how Jesus transforms us, and grows us in faith and in His likeness. And that is awesome! But it’s not our starting place. Because if we focus on “you can do better tomorrow,” and then they don’t do better tomorrow, they will feel defeat and despair. It’s the human condition. It’s that “I blew it again” feeling. When we confess our sin to Jesus, He never (ever) says, “I know, and you can do better tomorrow.” He says, “I know, and I love you!” He is full of grace. And that has to be our starting place if we want to reflect the heart of Jesus and His unconditional love to our kids. If we want them to understand His compassion and His mercy and His undeserved kindness, we start with, “He knows and He loves you!” We let them free fall into His grace! Grace changes the heart. Grace enables. Grace gives what “do better tomorrow” cannot. It’s in the experience of the “I know, and I love you” that our hearts are transformed. Radically transformed. If we want to reflect the heart of Jesus for our kids, then tomorrow is not a new day to be better, try harder, and do more. Tomorrow is a new day to remember that when we fail and we confess our sin, Jesus says, “I know, and I love you.” When that truly is the well from which we drink, we are filled to the brim. Think about it this way. When Cal would sin and I would say, “Cal how could you? You need to do better” I could see the despair painted all over his face. I knew exactly what he was thinking when I would say those words to him because he was thinking exactly what I think when someone says to me “Jeannie, how could you? You need to do better.” My response is, “I KNOW THAT! DUH! Good gravy, I AM TRYING!” I’m filled with despair. You see the cycle. It’s a vicious one. But grace breaks that cycle. Grace ushers in hope.